Assorted Pastries Until The Pug Dressed As An Old Lady Arrives? We all know why you’re here, and rest assured, the pug dressed as an old lady is on its way. 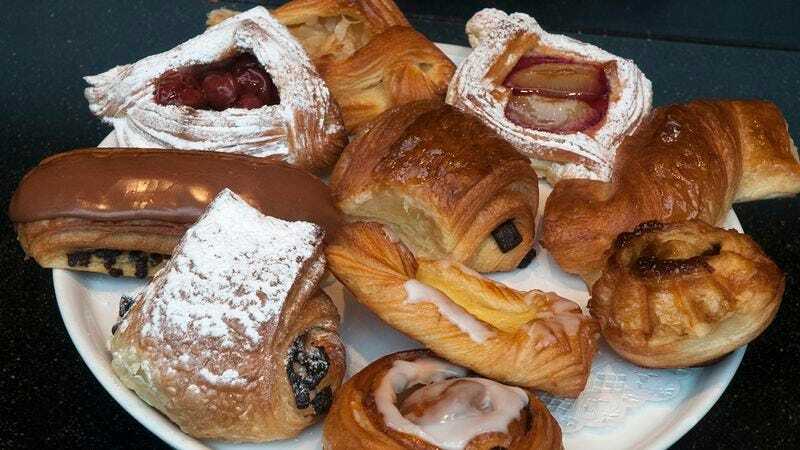 But in the meantime, please help yourself to a sampling of fine pastries. Care for a pecan roll? Just a little something to tide you over until the pug gets here. Seeing the pug dressed as an old lady will be a huge treat. But this eclair is a pretty good treat, too. Shouldn’t be much longer. It’s a dog, so it’s not like it has any other plans. Cannoli? Careful, this one’ll go straight to your thighs. But that’s okay—live a little! Thank you so much for your patience. Help yourself to one of these delicious tarts while we’re waiting on our adorable little granny pup to arrive. We know you could probably just Google “pug dressed like an old lady” and find something pretty similar, so we really appreciate you sticking around. It’s going to be good, though. Oh, man, you’re really going to like this dog. Just hang in there a little bit longer. Have a strudel, and by the time you’re done with it, the belle of the ball will be here. Ta-da! Just as promised, here is the pug dressed as an old lady. Her name is Oink. Isn’t she sweet? Thanks again for waiting around! Feel free to grab a bear claw for the road.